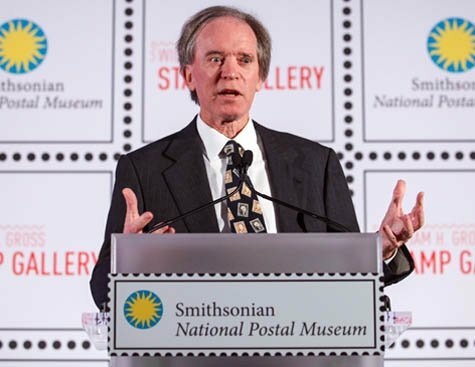 William H. Gross, the founder of PIMCO and a stamp collector, donated the initial $10 million to the Smithsonian Institution National Postal Museum (NPM) to create a new 12,000-square-foot gallery that was named in his honor. Over $8 million in additional funds was raised to contribute to the effort. The new gallery, which gives the museum public space at the street level, opened to the public on September 22, 2013. The gallery is the world's premier museum gallery dedicated to philately, the largest in the world. The Gross Stamp Gallery is comprised of five unique sections, resulting in a powerful and engaging experience for museum visitors. 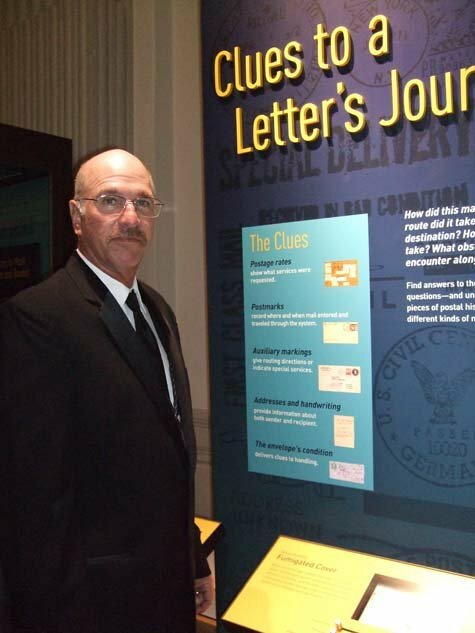 Each area showcases the museum’s world-class collection of philatelic and postal history objects and provides the public greater access and the Collection greater visibility. 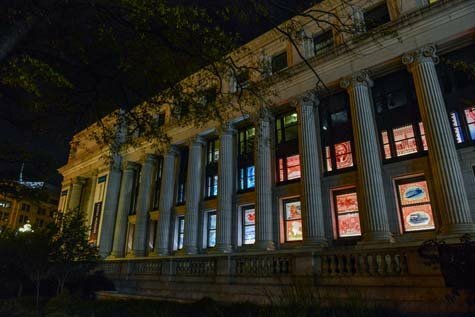 A glowing wall of windows features reproductions of 54 historic U.S. stamps that provide a spectacular backdrop to the 12,000 square feet of exhibits which continually reminds visitors that the history of stamps is intertwined with the history of America. Ribbon cutting ceremony at the Grand Opening Gala on September 21. Dignitaries from left to right are Dr. Cheryl Ganz, Senior Curator of Philately NPM; Donald Sundman, Chairman of the Council of Philatelists; G. Wayne Clough, Secretary of the Smithsonian Institution; William H. Gross, primary donor; Postmaster General Patrick Donohoe; Allen Kane, Director of the NPM, and Charles Shreve, Council of Philatelists and premier recruiter of major donors. Secretary of the Smithsonian Institution, G. Wayne Clough, (at left) leads applause for the contribution made by William H. Gross (at right) for whom the new Stamp Gallery is named. 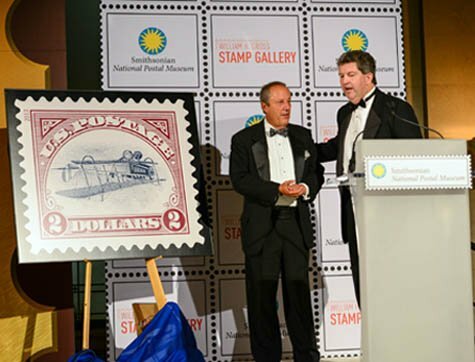 Left above: Postmaster General Patrick Donohoe (right) congratulates National Postal Museum Director Allen Kane on a job well done. Allen was the mover and shaker whose management made the Gross Gallery a reality. The newly issued $2 Inverted Jenny was unveiled at the Gala. The arrow margin block of four of the "C3a" 1918 Inverted Jenny is on loan by Gross to the Gallery. 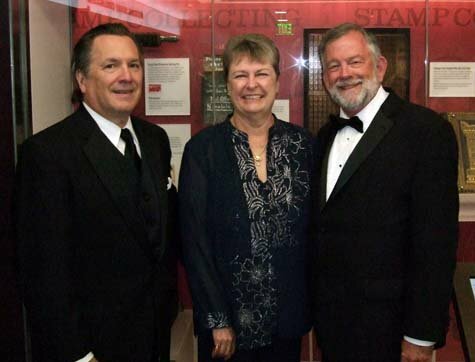 Right above: Posing in front of the Confederate "Lost Plate" display in the new Gallery are (left to right) Tom Lera, the Winton M. Bount Chair in Research at the NPM; Council of Philatelists member Trish Kaufmann and CSA President Rich Murphy who officially represented the Confederate Stamp Alliance. At the time of the Gross Gala, Lera was CSA Treasurer and Kaufmann is a Past President of the CSA. 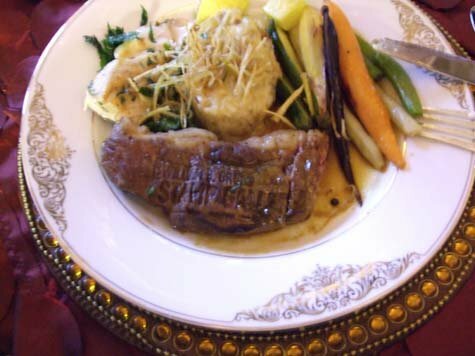 For the Gross Gala dinner, at left, a strip steak "canceled" with a William H. Gross Stamp Gallery "brand." 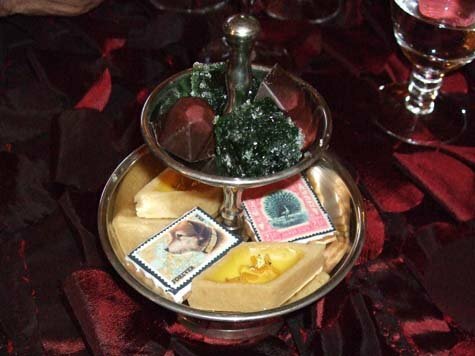 At right are Petite "Postal" Sweets served with demitasse. Owney was a scruffy mutt who road the Railway Post Office train cars across the country in the 1800s. He is pictured on the left shortbread cookie. Railway mail clerks adopted Owney as their unofficial mascot, marking his travels by placing medals and tags on his collar. His final resting place is the NPM where he is on permanent display. 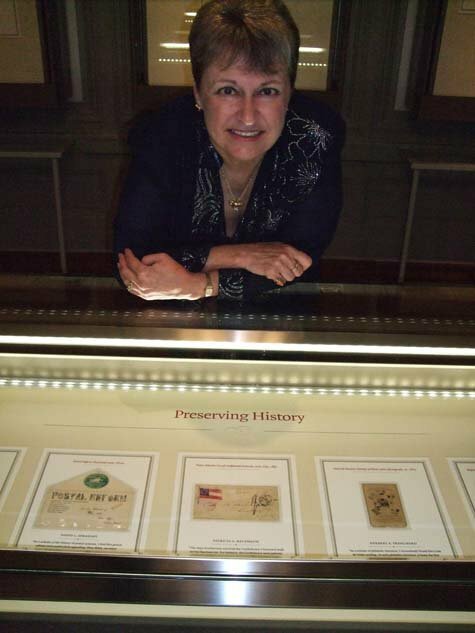 At left, Darryl Boyer (husband of Trish Kaufmann) admires one of the exhibits while Trish, at right, poses in front of the Confederate patriotic cover that she loaned to the Gross Gallery for the "Favorite Finds" exhibit displayed in the Postmaster's Suite. It is one of only two known such covers from the Confederacy to a foreign destination. 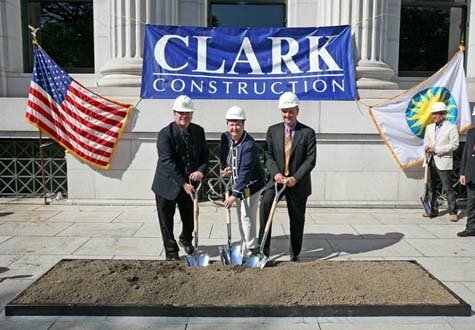 CSA members were honored to participate in the Ground Breaking Ceremony of the William H. Gross Stamp Gallery on June 4, 2012 in front of the Smithsonian National Postal Museum. Wielding the shovels, left to right, are Tom Lera, Trish Kaufmann and CSA member / COP member Vince King. Kaufmann and King are two of the founding donors of the Gross Gallery. 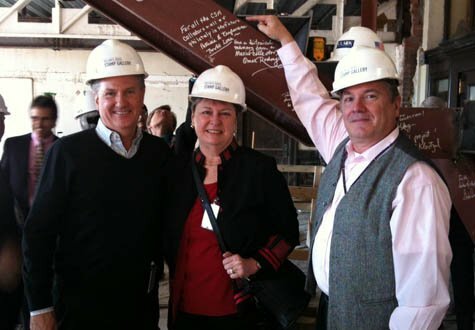 At right, on November 9, 2012, Vince King, Trish Kaufmann and Tom Lera posed with their newly placed signatures on the stair beams of the Gross Gallery (Tom pointing), at that time still under construction. Some day, perhaps a hundred years from now or more, future renovators may find them. 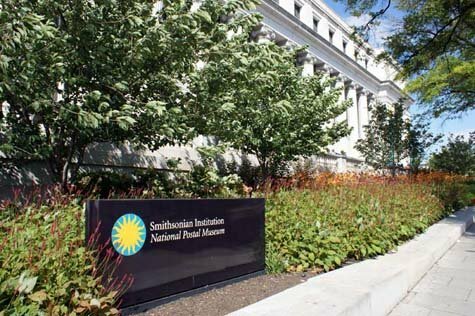 Some of the photos shown here are courtesy of the Smithsonian National Postal Museum. 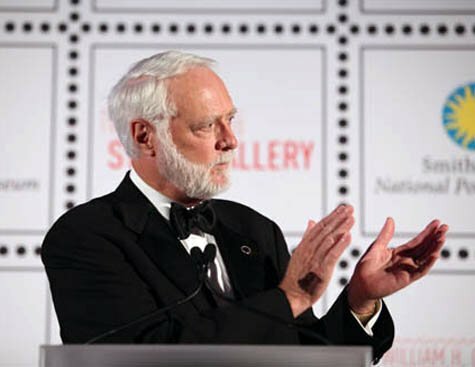 Many more photos of the Gallery, opening First Day ceremonies, and information about the William H. Gross Stamp Gallery are available via the highlighted link.